In the competitive 2013 the karatekas of SC "Kyokushin" Shumen made a very strong performance, winning 79 medals in all age groups so far, all of them from official events of the sports calendar of the Bulgarian Shinkyokushin Karate Federation. Shumen's fighters also were a strong presence in the European championship in Shinkyokushin karate, which took place on the 15th and 16th of November in Oradeia, Romania. The greatest joy was brought by the young national competitors Ivelina Petrova and Dzhaner Shukri, who won 1 silver and 1 bronze medal respectively on this presitigious stage. Ivelina Petrova of SC "Kyokushin" Shumen, who made a very strong debut in the European championship, winning second place in the kadets 55kg category. In her first match Shumen's young competitor won by decision over Chise Denisa of Romania, then defeated Vilze Durenoval Larse of Norway by vazaari after a well placed djodan mawashi geri. In her quarterfinal after a very strong series of fist strikes and hidza geri she won again by vazaari over Drazba Marlena of Poland, after which followed a brilliant semifinal match against Lidia Soriano of Spain, won by Shumen's young talent with vazaari by shita-ski. After a very close and even final match against Veronika Nemeth of Hungary, Ivelina had to take home the silver. Shumen's other national competitor, Dzhaner Shukri, also a debutant on the European championship, fought very strong matches in the kadets 60kg category on this great stage. In his first match Shumen's young fighter defeated Gryziukowski Adam of Poland, then overcame Adrian Vastag of Hungary by vazaari, after which came a very hard semifinal against Laurynas Vaicikauskas of Litva, against whom Shumen's competitor came out, having still not recovered from the previous match and had to settle for third place. From Zone competitions - 7 first, 11 second and 10 third places. 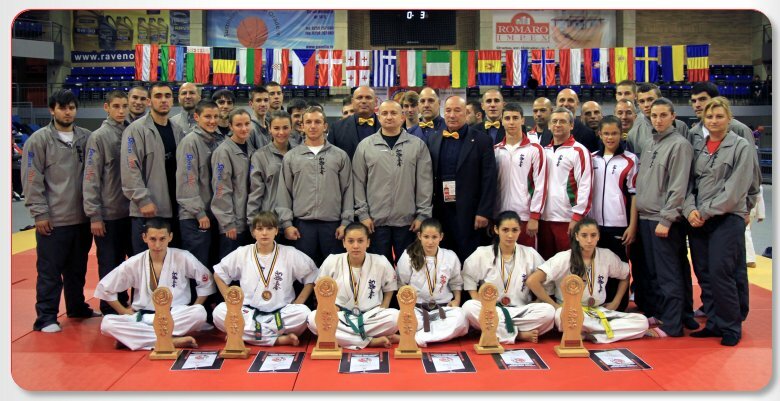 In 2013 SC "Kyokushin" Shumen was host to the Internationa tournament for the "Madarski konnik" cup for men and women and received praise from the Bulgarian Shinkyokushin Karate Federation for the organization of the event. Sponsors of the Shumen teams for the entire competitive year 2013 were: The Municipality of Shumen, "Ultima" ltd, "Agrofresh" ltd, "Strongstroi" ltd, "Kodika" ltd, 3 S COT, ICON, "PIGMENT design", ET Varnalia - M. Alishev. Shumen's karatekas heartedly thank their friends, for without their help the competitors would not have been able to take part in these strong events of the sports calendar of the BSKF. 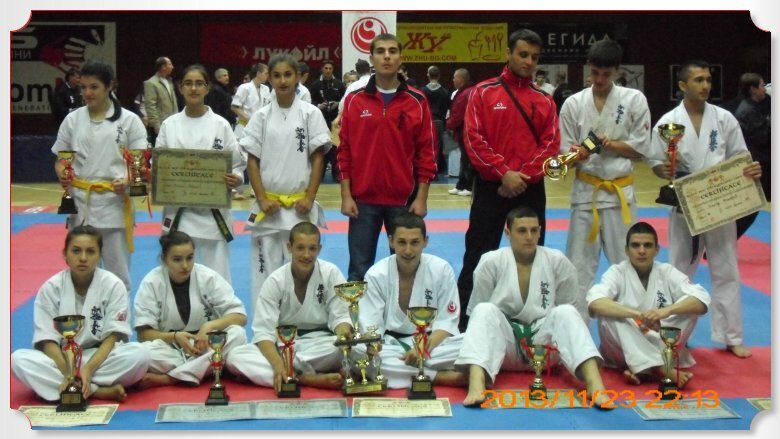 On 23.11.2013 in the "Boicho Branzov" hall in Burgas took place the International tournament for the "Cherno More" cup in Shinkyokushin karate for juniors and kadets. In the competition, thanks to the excellent organization by the hosts, took part many of the young talents of the Bulgarian Karate Shinkyokushin Federation from clubs of the whole country. Among them were a part of the National teams of juniors and kadets. An exceptionally strong performance was made by the competitors of SC "Kyokushin" Shumen with chairman Stoian Obretenov - IInd dan. They won 3 gold, 4 silver and 3 bronze medals. 1.Viktor Ulianov in the kadets 50kg category, who won his semifinal against Toni Nikolov of SKC "Malnia" Haskovo by ippon. 2.The european runner-up and two-time republican champion for 2013 /in both juniors and kadets/ Ivelina Petrova did not face difficulties in the kadets 55kg category and deservingly took the highest spot on the winner's podium. 3.Dzhaner Shukri /bronze medalist in the European championship for kadets/ in the kadets 60kg category, who in his semifinal defeated Dimitar Tumbev of ASKC "Trakia" Plovdiv by ippon after a series of shita-ski and chudan hidza geri. In his final match he knocked his croatian opponent Fran Lukshich out with dzhodan hidza geri and along with first place was awarded by the judges the prize for the best technique in this age group. 1.Petar Aleksandrov, for whom this was his debut in a large event in kadets. The young competitor of SC "Kyokushin" Shumen won his semifinal over Nikolai Zaprianov of ASKC "Trakia" Plovdiv by ippon. 2.Aleksandar Stanchev in kadets, who fought a great semifinal match and was leading in the finals, when he unfortunately suffered a heavy injury and had to settle for second place. 3.Ivanina Petkova, who made a great debut in kadets, defeating the national competitor Tsvetelina Ivancheva of SC "Tornado" Pazardzhik in her semifinal. 4.Simona Stoianova in kadets, who came back after two years of healing from a heavy knee injury. 1.Nesrin Nezhdet in kadets, who still competes in children up to 14 years of age and this event was great experience for her. 3.Kaloian Georgiev in kadets, who in his first match won by vazaari over his opponent from ASKC "Trakia" Plovdiv after a very strong low kick and in his match for third place successfully overcame Zorin Monchev from SSKC "Lovech" Lovech. The competitors of SC "Kyokushin" Shumen were able to take part in the International tournament for the "Cherno more" cup in Shinkyokushin karate for juniors and kadets in Shinkyokushin karate thanks to the help of the Municipality of Shumen. 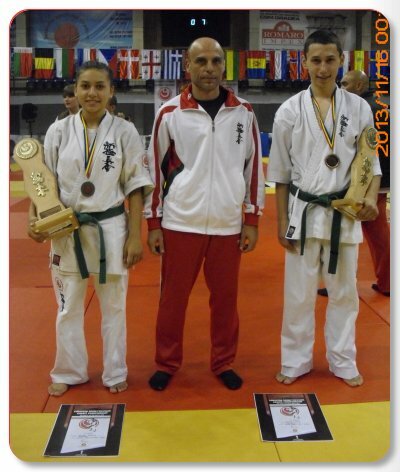 On 15-16.11.2013 in Oradeia, Romania was held the European championship in Shinkyokushin karate for kadets, men and women up to 22 years of age, men and women absolute category in kumite and kata. A strong performance was made by the competitors of the National teams of Bulgaria, winning 1 gold, 4 silver and 7 bronze medals. In the men U-22 70kg category Lachezar Dimitrov decisively won all his matches, running over his opponents with vazaari and ippon and winning the european title for Bulgaria. 1.Ianitsa Stefanova - in the U-22 65kg cat. 2.Nikola Ianev - in U-22 the +85kg cat. 3.Krisiana Laleva in the kadets 50kg cat. 4.Ivelina Petrova of SC "Kyokushin" Shumen, who made a very strong debut in the European championship, winning second place in the kadets 55kg category. In her first match Shumen's young competitor won by decision over Chise Denisa of Romania, then defeated Vilze Durenoval Larse of Norway by vazaari after a well placed djodan mawashi geri. In her quarterfinal after a very strong series of fist strikes and hidza geri she won again by vazaari over Drazba Marlena of Poland, after which followed a brilliant semifinal match against Lidia Soriano of Spain, won by Shumen's young talent with vazaari by shita-ski. After a very close and even final match against Veronika Nemeth of Hungary, Ivelina had to take home the silver. 1.Vasil Vangelov in the men absolute category. 2.Nikolai Varshilov in the U-22 85kg cat. 3.Violeta Litovska in the U-22 55kg cat. 4.Dzhaner Shukri of SC "Kyokushin" Shumen, also a debutant on the European championship, who fought very strong matches in the kadets 60kg category on this great stage. In his first match Shumen's young fighter defeated Gryziukowski Adam of Poland, then overcame Adrian Vastag of Hungary by vazaari, after which came a very hard semifinal against Laurynas Vaicikauskas of Litva, against whom Shumen's competitor came out, having still not recovered from the previous match and had to settle for third place. 5.Denitsa Mladenova in the kadets 60kg cat. 6.Andreana Momcheva in the kadets 65kg cat. 7.Denitsa Georgieva in kadets kata. In this European championship took part 400 competitors from 21 countries in all categories. The competitors of SC "Kyokushin" Shumen were able to take part in the European championship in Shinkyokushin karate for kadets, men and women up to 22 years of age, men and women absolute category in kumite and kata thanks to the help of the Municipality of Shumen, "Ultima" ltd, "Strongstroi" ltd, "Agrofresh" ltd. The karatekas of Shumen continue their preparation for the International tournament for kadets and juniors for the "Cherno more" cup, which will take place in Burgas on 23.11.2013.